It’s all music to me, whether sung or recited. Well-wrought words have an incantatory power to move us, to grip us, to entice us. 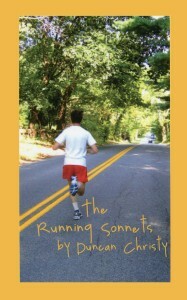 And that’s what I’ve aimed for in The Running Sonnets, a homage to running. There are 41 poems covering all aspects of running with complementary visuals for each. Its firmly striding design is the work of Susan Forrest Castle, and with its blend of words and images there is nothing like it in the literature of running or of sport. May I make this suggestion if you order the volume: Choose the printed book (Amazon). That way you’ll see the pages as they were intended to be seen, with each poem facing its chosen visual. And if you’d like to invite me to read for you, I’ll come. In any significant means and ways. Leaving me juvenated, breathless, mint. With a surgeon’s deftness, flashing and fair. So generously, the jewels of the road.